Grifola frondosa is a polypore mushroom that grows in clusters at the base of trees, particularly oaks. The mushroom is commonly known among English speakers as Hen- of-the-Woods, Ram’s Head and Sheep’s Head. In the United States’ supplement market, as well as in Asian grocery stores, the mushroom is known by its Japanese name “Maitake”, which means “dancing mushroom”. The fungus is native to the northeastern part of Japan and North America, and is prized in traditional Chinese and Japanese herbology as a medicinal mushroom, an aid to balance out altered body systems to a normal level. Most Japanese people find its taste and texture enormously appealing, though the mushroom has been alleged to cause allergic reactions in rare cases. G. frondosa grows from an underground tuber-like structure, about the size of a potato. The fruiting body, occurring as large as 60 cm, is a cluster consisting of multiple grayish- brown caps which are often curled or spoon-shaped, with wavy margins and 2-7 cm broad. In Japan, the Maitake can grow to more than 50 pounds (20 kilograms), earning this giant mushroom the title “King of Mushrooms.” Maitake is one of the major culinary mushrooms used in Japan. The underground tubers from which hen of the woods arise have been used in traditional Chinese and Japanese medicine to enhance the immune system. Researchers have also indicated that whole maitake has the ability to regulate blood pressure, glucose, insulin, and both serum and liver lipids, such as cholesterol, triglycerides, and phospholipids, and may also be useful for weight loss. Maitake is rich in minerals (such as potassium, calcium, and magnesium), various vitamins, fibers and amino acids. One active constituent in Maitake for enhancing the immune activity was identified in the late 1980s as a protein-bound beta-glucan compound. Cantharellus cibarius, commonly known as the chanterelle or golden chanterelle, is a fungus. It is probably the best known species of the genus Cantharellus, if not the entire family of Cantharellaceae. It is orange or yellow, meaty and funnel-shaped. On the lower surface, underneath the smooth cap, it has gill-like ridges that run almost all the way down its stipe, which tapers down seamlessly from the cap. It has a fruity smell, reminiscent of apricots and a mildly peppery taste (hence its German name, Pfifferling) and is considered an excellent edible mushroom. Chanterelles are common in northern parts of Europe and North America, including Mexico, in Asia including the Himalayas, and in Africa including Zambia. 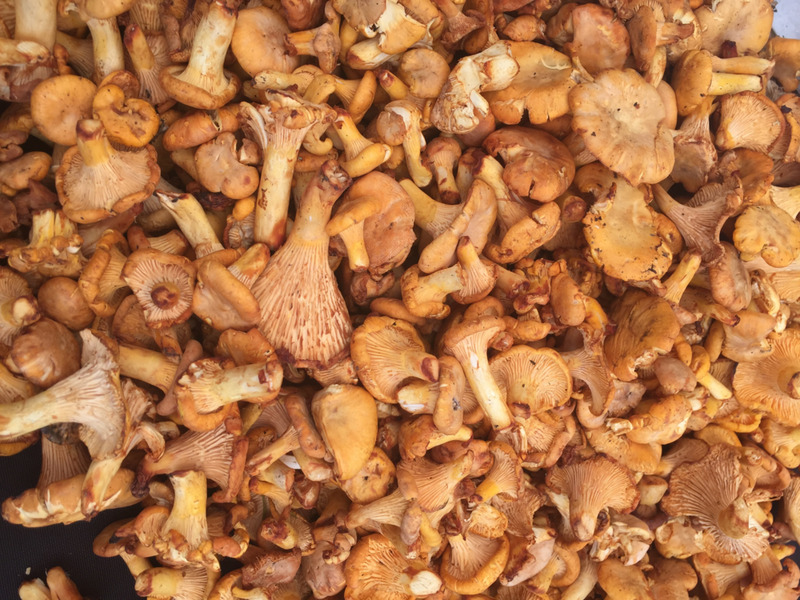 Chanterelles tend to grow in clusters in mossy coniferous forests, but are also often found in mountainous birch forests and among grasses and low-growing herbs. In central Europe, the golden chanterelle is often found in beech forests among similar species and forms. Chanterelles as a group are generally described as being rich in flavor, with a distinctive taste and aroma difficult to characterize. Some species have a fruity odor, others a woodier, earthy fragrance and others still can even be considered spicy. The golden chanterelle is perhaps the most sought-after and flavorful chanterelle, and many chefs consider it on the same short list of gourmet fungi as truffles and morels. Agaricus bisporus—known variously as the common mushroom, button mushroom, white mushroom, table mushroom, champignon mushroom, crimini mushroom, Swiss brown mushrooms, Roman brown mushrooms, Italian brown, Italian mushroom, cultivated mushroom, or when mature, the Portobello mushroom—is an edible basidiomycete mushroom native to grasslands in Europe and North America. Agaricus bisporus is cultivated in at least 70 countries around the world. Global production in the early 1990s was reported to be more than 1.5 billion kg, worth more than US$ 2 billion. Agaricus bisporus also contains sodium, potassium, and phosphorus, conjugated linoleic acid and antioxidants. In 2009, a case control study of over 2,000 women correlated a large decrease of breast cancer incidence in women who consumed mushrooms. Women in the study, who consumed fresh mushrooms daily, were 64% less likely to develop breast cancer, while those that combined a mushroom diet with regular green tea consumption, reduced their risk of breast cancer by nearly 90%. The table mushroom has also been shown to possess possible immune system enhancing properties. Shiitake are native to China and Japan and have been grown in both Japan and China since prehistoric times. They have been cultivated for over 1,000 years. The oldest record regarding the shiitake mushroom dates back to AD 199 at the time of Emperor Chūai in Japan. However, the first written record of shiitake cultivation can be traced to Wu Sang Kwuang, born during the Sung Dynasty (AD 960–1127). During the Ming Dynasty (AD 1368–1644), physician Wu Juei wrote that the mushroom could be used not only as a food but as a medicinal mushroom, taken as a remedy for upper respiratory diseases, poor blood circulation, liver trouble, exhaustion and weakness, and to boost qi, or life energy. It was also believed to prevent premature aging. Fresh and dried shiitake have many uses in the cuisines of East Asia. In Chinese cuisine, they are often sauteed in vegetarian dishes such as Buddha’s delight. In Japan, they are served in miso soup, used as the basis for a kind of vegetarian dashi, and also as an ingredient in many steamed and simmered dishes. In Thailand, they may be served either fried or steamed. Today, shiitake mushrooms have become popular in many other countries as well. Because they can now be grown world wide, their availability is widespread and their price has decreased. Modern research has indicated shiitake mushroom may stimulate the immune system, possess antibacterial properties, reduce platelet aggregation, and possess antiviral properties, possibly through antiviral agents known as proteinase inhibitors. The oyster mushroom, Pleurotus ostreatus, is a common edible mushroom. It was first cultivated in Germany as a subsistence measure during World War I and is now grown commercially around the world for food. The oyster mushroom may be considered a medicinal mushroom, since it contains statins such as lovastatin which work to reduce cholesterol. The oyster mushroom is frequently used in Japanese, Korean and Chinese cookery as a delicacy: it is frequently served on its own as soup, sometimes stuffed, or in stir-fry recipes with soy sauce. Oyster mushrooms are sometimes made into a sauce, used in Asian cooking, which is similar to oyster sauce. The mushroom’s taste has been described as a mild with a slight odor similar to anise. A truffle is the fruiting body of an underground mushroom; spore dispersal is accomplished through fungivores, animals that eat fungi. There are hundreds of species of truffles that are big, but the fruiting body of some are highly prized as a food. The 18th-century French gastronome Brillat-Savarin called these truffles “the diamond of the kitchen”. Edible truffles are held in high esteem in French, Spanish, northern Italian and Greek cooking, as well as in international haute cuisine. The “black truffle” or “black Périgord truffle” (Tuber melanosporum) is named after the Périgord region in France and grows exclusively with oak. Specimens can be found in late autumn and winter, reaching 7 cm in diameter and weighing up to 100 g. Production is almost exclusively European, with France accounting for 45%, Spain 35%, Italy 20%, and small amounts from Slovenia, Croatia and the Australian states of Tasmania and Western Australia. About 80% of the French production comes from southeast France. The largest truffle market in France (and probably also in the world) is at Richerenches in Vaucluse. The largest truffle market in southwest France is at Lalbenque in Quercy. These markets are busiest in the month of January, when the black truffles have their highest perfume. 9fruiting in autumn, they can reach 12 cm diameter and 500 g, though are usually much smaller. The flesh is pale cream or brown with white marbling. Like the French black truffles, Italian white truffles are very highly esteemed. The white truffle market in Alba is busiest in the months of October and November, where a 1.6-pound white truffle sold to “The Cody” of southern California for $150,000 on November 8, 2009 during the 79th White Truffle Festival. The Tuber magnatum pico white truffle is found mostly in northern and central Italy, while the Tuber borchii, or whitish truffle, is found in Tuscany, Romagna, the Marche and Molise. Neither of these is as aromatic as those from Piedmont.